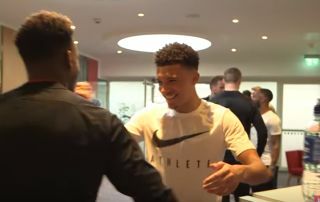 Chelsea fans may want to take a look at this video as Callum Hudson-Odoi and Jadon Sancho get friendly on England international duty. As most Blues fans will be well aware by now, Hudson-Odoi’s future at Stamford Bridge is in serious doubt following three rejected bids from Bayern Munich in January. The Bavarian giants are expected to come back in for the 18-year-old after his lack of opportunities in the Chelsea first-team, and they will surely be glad to see him chatting with Sancho. Sancho is currently relishing having left the Premier League for the Bundesliga after shining at Borussia Dortmund in the last couple of seasons. Hudson-Odoi is yet to sign a new contract at Chelsea and it seems he’s now about to spend a lot of some with someone who could quite justifiably persuade him that a move to Germany would be the best next step for his career.